Welcome to the New Standard for Quality & Performance. An absolute guarantee of quality. NRT 2x72 knife making belt grinder! Manufactured in house on state of the art CNC machining centers to the tightest possible tolerances. The O.D and I.D of our drive and tracking wheels are machined in the same set up so they are truly as concentric as the machine spindle. You can’t get any better than that! Precision laser cut 1/4 inch side & bottom plates. All packages include Ratchet Tensioner. The side plates are acid washed powder coated with a special silver vein powder that is tougher than normal solid color powder coating. High quality heat treated socket head cap screw fasteners and custom machined hardware. Bolt on aluminum Tilting Stand option allows you to upgrade at a later date. 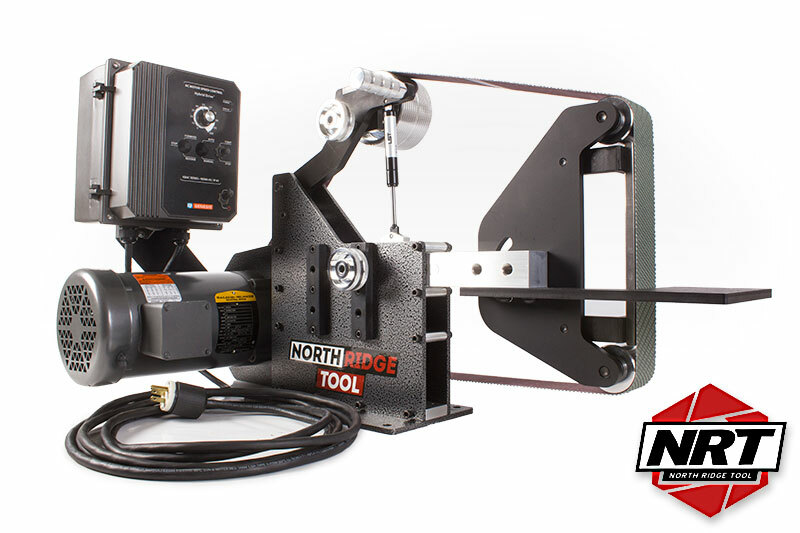 Comes with a flat platen & tool rest on an 1.5 inch aluminum arm. 5 inch drive wheel with 5/8 shaft & 3/16 keyway. Two motor options with Variable Frequency Drive for up to 4700 FPM belt speed. MADE IN THE USA with USA made materials. Northridge tool is a state of the art machining facility. We have a long standing commitment of technical and manufacturing expertise. Northridge tool has a wide range of precision machining, surface finishing, and heat treating processes for many different materials such as Stainless Steel, Aluminum, Copper, Titanium, Inconel, Vespel and Ceramics. After years in the firearms, medical device, and aerospace fields we are bringing our experience of high tolerance machining and design to the world of Knife Grinders. Our fit and finish is second to none and our commitment to customer service is our top priority. Our 2x72 belt grinder is designed & machined with the latest CAD/CAM software on state of the art milling and turning machines. We decided to stay with the traditional quick change tooling arm design of legacy machines but added a second tooling arm slot to accommodate many accessories, like our R.A.T. Arm and surface grinding attachments. We have tried to leave no detail unchecked in the manufacturing of this 2x72 knife making belt grinder and we believe it to be the most thought out and precisely made belt grinder on the market.